Recently I have found our family routine has been thrown into disarray by my husband's new job which involves shift work, the chaotic and unpredictable nature of children with after school activities and teens with jobs and social lives. Meal planning has become difficult and my usual freezer fall backs like chops and roasts have proved not so suitable as our family shrinks rapidly with birds flying the nest. The main issue is that it's increasingly difficult for us to all sit down together to eat - my husband might finish at 2pm, or 5pm or 10pm. The teens might need to go babysitting or be back later than usual because of youth clubs. I've started to make more slow cooker meals which firstly suit the season and secondly mean people can serve their own meal when it fits in. We do make an effort to eat together when possible of course but I'm sure I'm not alone in sometimes thinking like our home feels a bit like a hotel with lengthy food service hours. 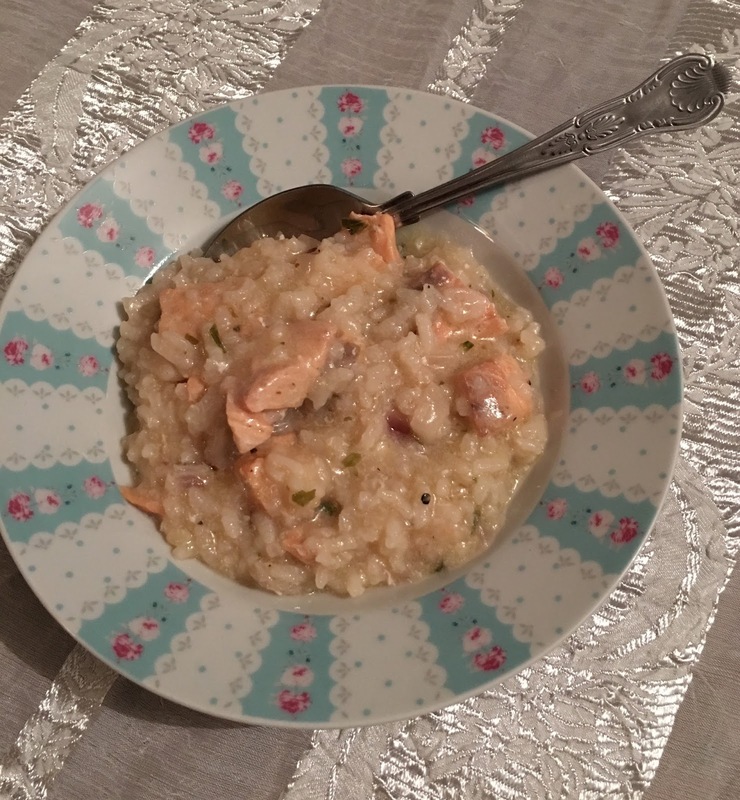 This recent successful slow cooker salmon and rice experiment came about when I blithely informed my husband that even though I was going out to a meeting before he would return from work I would "leave something" for him to eat. The children had all been to friends for tea, apart from my teenage daughter who was working until 6.30pm. Hubby would not be back until 8pm. A quick scrabble through the freezer and cupboards unearthed nothing that would suit the three of us, apart from some slightly sorry looking frozen salmon pieces. My daughter loves rice so I decided to go down that route but wanted something that would keep for hubby. 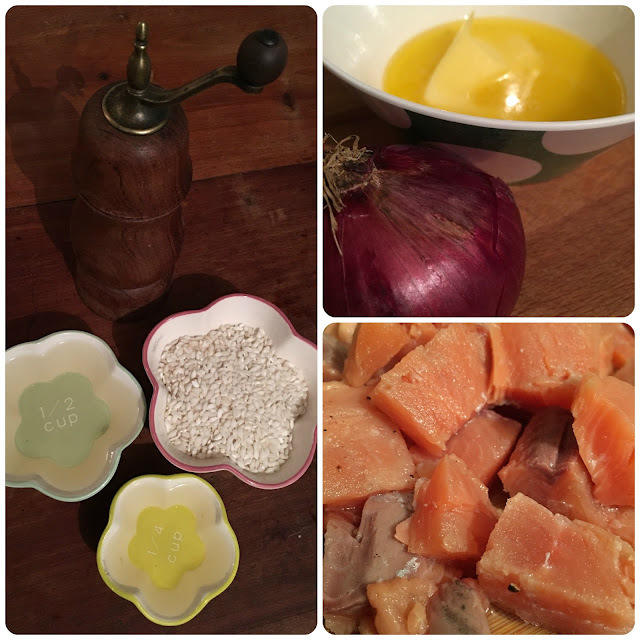 I've tried slow cooker risotto before - it does come out a bit stodgy but I quite like that! 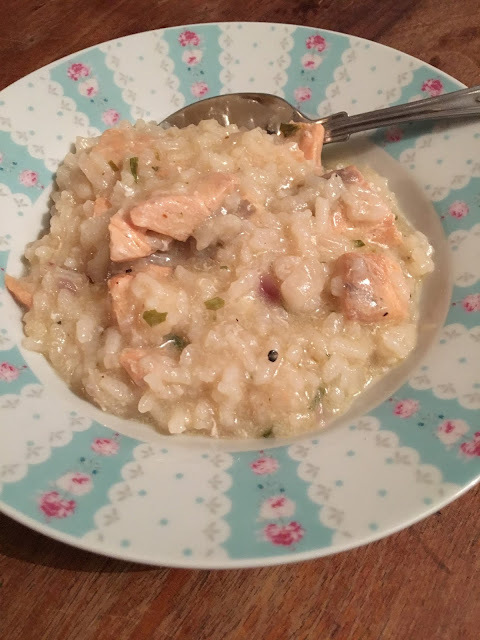 Adapting another recipe I found does create a slightly more authentic risotto - it's still very moist but less "one slice or two" than previous experiments. I used a small "two person" slow cooker. It was full to the brim! Double quantities and use a large crockpot for a generous serving for 6-8 people. It's not a slow cooker recipe where you bung in ingredients and go out for five hours - it requires some regular attention but is still a lot less time consuming than pan-cooked risotto and has the benefit that it will be ok to stand in the slow cooker for a while after completion. 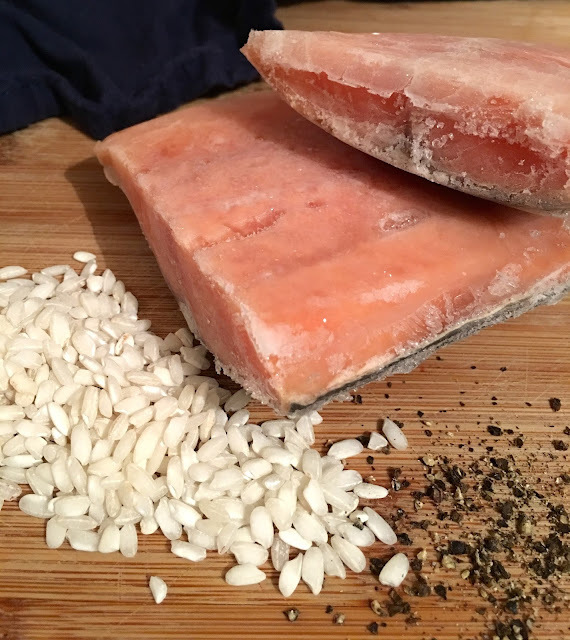 one piece of salmon per person, defrosted, skinned and diced. Set slow cooker to high. Add melted butter and onion. Cover and cook for 25 minutes. Stir in the rice - it should make a crackling popping noise as it hits the hot butter. Add white wine and stock and stir. Cover and cook for 45 minutes, stirring halfway through cooking. Stir in the diced salmon and season well with salt, pepper and if using dried tarragon, add this now. If using fresh tarragon it should be added just before serving. This quantity easily served four with extra helpings.